MusclePharm® is leading the charge as The Athletes’ Choice for a pre-workout supplement that delivers results — Safely. Unlike “stimulant-concentrated” formulas that hit hard and then leave you hanging like you just got mugged in a dark alley…is there from start to finish. Developed at the state of the art MusclePharm® Sports Science Center, is the most researched pre-workout product on the market today. 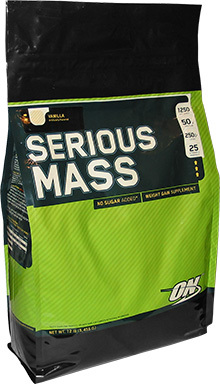 As athletes ourselves, we wanted it to do more than pack serious muscle-building power. We set the safety bar sky-high so other athletes know that they’re supporting their bodies with a great supplement. We are proud to say that is one of the only pre-workout products on the market that has certifications from Informed-Choice® as Banned Substance Free. the START…TO THE VERY LAST SET. PREPARE TO ASSAULT THE GYM. 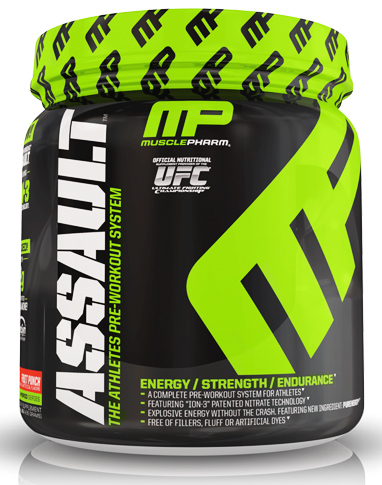 Assault's pre-workout formulation is the most advanced and complete pre-workout system on the market. 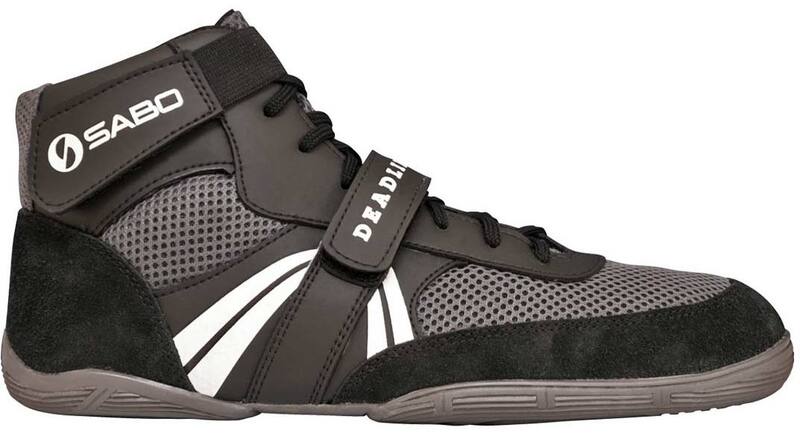 Precision-engineered to give athletes the ultimate performance advantage over the competition. Assault's 5-Stage delivery system addresses every angle of performance: Size. Energy. Focus. Strength. Endurance. Caffeine is a wildly-popular supplement for increasing performance and alertness. Normal caffeine sources leave you crashing quickly, but our PurEnergy™ ingredient gives you focus and energy that lasts 8 times longer than normal caffeine, without the typical caffeine "crash." Energy/Strength/Endurance - Stay focused and blasting from the first rep to the very last set. 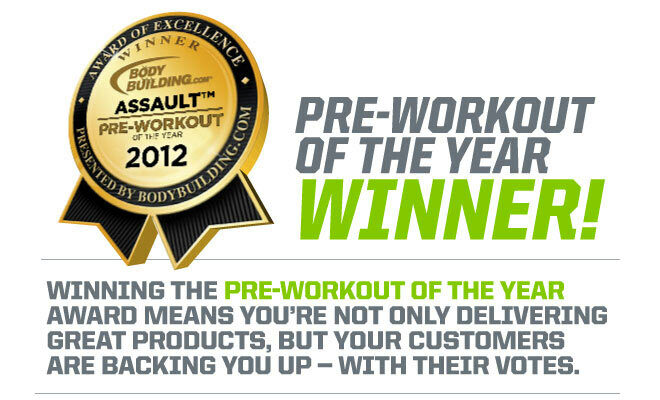 Prepare to Assault the gym with our revolutionary 5-stage delivery system! 5 Stage Delivery System: Attacks every angle of performance - 1. ATP Amplifier - The ultimate lactic acid buffer. 2. 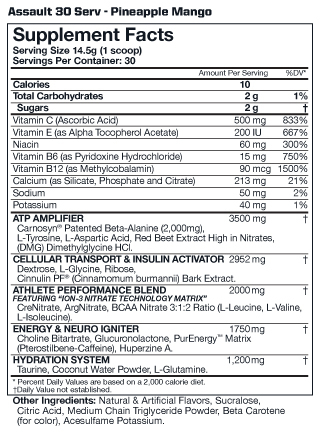 Athlete Performance Blend featuring 'ION-3 Nitrate Technology Matrix.' 3. Cellular energy & insulin activator. 4. Energy & neuro igniter. 5. Hydration system. Real Doctors. Real Science. Real Innovation. This Is MusclePharm. 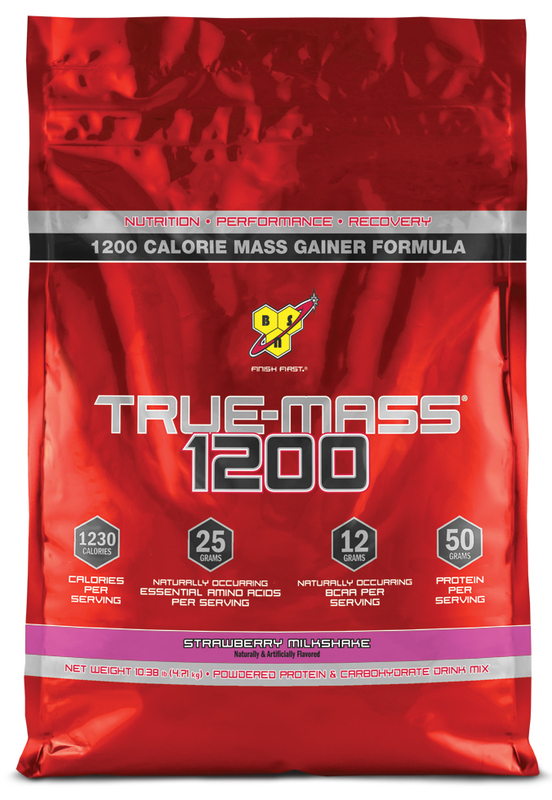 1 Each serving contains 2 grams of patented CarnoSyn® Beta-Alanine, which is proven to promote the buffering of lactic acid while boosting performance and muscular endurance during high intensity exercise. Research indicates that the added Hawthorne Berry and Beet Root lead to increased short- and long-term Nitric Oxide production, exercise tolerance and plasma nitrates. Plasma nitrates, when broken down, result in added plasma nitrite and nitrate. DMG supplements benefit endurance athletes-or anyone wanting to reduce risks of infection while training. Increasing systemic Nitric Oxide bioavailability leads to harder workouts, better health and an untouchable Nitric Oxide pump. ATHLETE PERFORMANCE BLEND - FEATURING: "ION-3 NITRATE TECHNOLOGY MATRIX"
2 This is the first and only pre-workout product to deliver Creatine, Arginine, and BCAA's in a special nitrate form that features ION-3 Nitrate technology. Cutting-edge ION-3 Nitrate fuels more efficient vasodilation to open up blood pathways into the muscles, improving the effectiveness of the ordinary molecule. Nitrates create vasodilation and increased blood flow to enhance distribution of nutrients. As a vasodilator, nitrate opens up blood pathways, which has been shown to help promote nutrient delivery and amplify athletic performance, leading to improved strength, recovery and muscle mass. 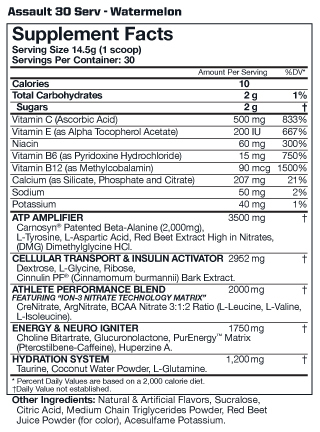 Check out the components that make up the ION-3 compound. By fusing nitric acid and creatine, the result is Creatine Nitrate: a highly absorbable creatine that increases the body's Nitric Oxide and ATP levels. This ultra-efficient vasodilator opens up blood pathways to promote nutrient delivery and muscle pumps. 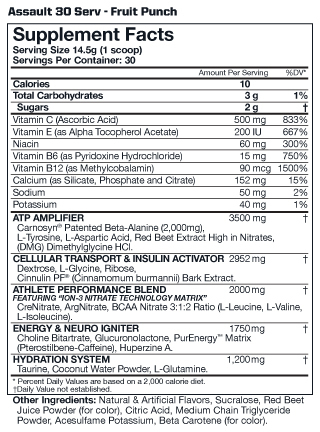 As an added benefit, Creatine Nitrate enhances intestinal absorption. Arginine Nitrate is a fusion of L-Arginine and Nitric Acid. Arginine creates nitric oxide to support vascularity and strength while promoting healthy growth hormone levels. Highly absorbable Nitrate is a derivative of nitric acid that enlarges muscles' blood pathways. Nitrate activates smooth muscle tissue and enlarges the arteries, veins and capillaries to maximize blood flow to areas like your biceps, triceps and quads. 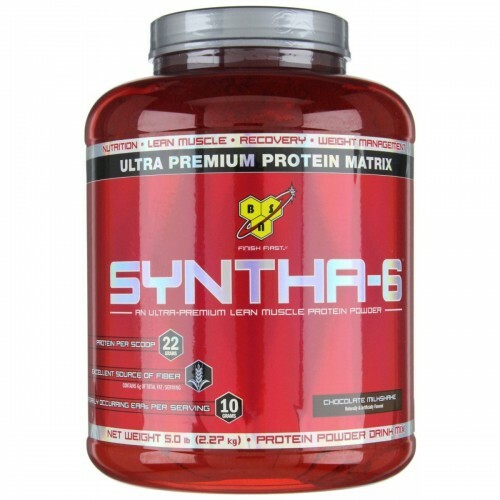 Branched Chain Amino Acids fused with a nitrate component-a true scientific breakthrough! This fusion provides for greater BCAA stability and more efficient transport across intestinal and muscle cell membranes due to nitrates' ability to enhance permeation. Nitrate-bound amino acids are far superior for nutrient absorption by the gut compared to free-form amino acids and chemical salts. 3 Introducing the ultimate cellular transport volumizer, a combination of the workout-building nutrients Glycine, D-Ribose, Dextrose and Cinnulin PF. These create insulin to increase anabolism through nutrient uptake for muscle growth and repair. The simplest amino acid, it plays a key role in the formation of proteins, peptides, glycogen, and ATP. Glycine availability allows for a quicker, faster building process - a bigger, faster "you." As the carrier molecule for ATP production, D-ribose leads to harder and longer workouts. Coupling D-ribose and glycine amplifies ATP production. 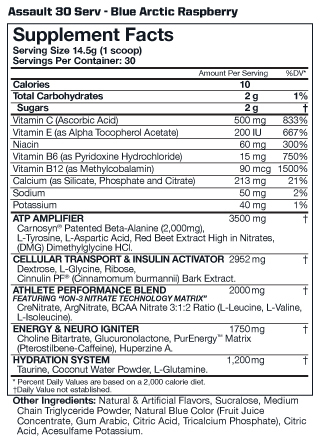 In conjunction with creatine, this combination creates substantial amounts of ATP, fueling even the toughest workouts. A simple sugar, can be consumed before, during and after training sessions to increase intensity by triggering a rapid insulin response. As a natural anabolic hormone, insulin feeds muscle cells. Potentiates the effects of insulin and helps D-ribose and Glycine bring nutrients to muscle cells. For increasing muscle strength and lean mass, no other Cellular Transport Volumizing Matrix has been scientifically put together like this. It's time to get leaner, faster, stronger and harder. 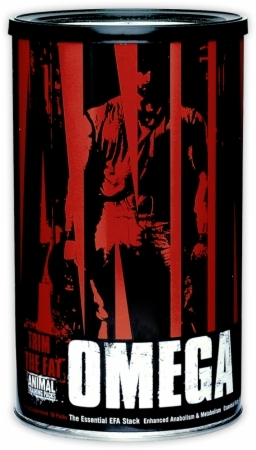 Caffeine is a wildly-popular supplement to help increase performance and alertness. Normal caffeine sources crash quickly, leaving you feeling restless. Patented ingredient PURENERGY™ gives you lasting focus and energy that lasts 8 times longer than normal caffeine, and without the "crash." Our Patented-protected PurEnergy™ combines the effects of caffeine and pTeroPure pterostilbene - to create a safer way to achieve energy. PurEnergy™ maximizes pterostilbene's anti-oxidant, heart-healthy benefits by using the product's co-crystalized form. Increase focus. Boost your energy. Get the same amount of caffeine, only with longer-lasting benefits. PurEnergy™. 5 Formulated to assist with staying energized and hydrated, our Hydration System is an advanced combination of electrolytes, coconut water (powder), glutamine and taurine. The different components come together to hydrate and repair the body. Potassium, Phosphate, Magnesium and Sodium help maintain fluid levels and regulate body functions in areas like the muscle and nervous systems. Without these essential elements, proper muscle contraction couldn't occur. 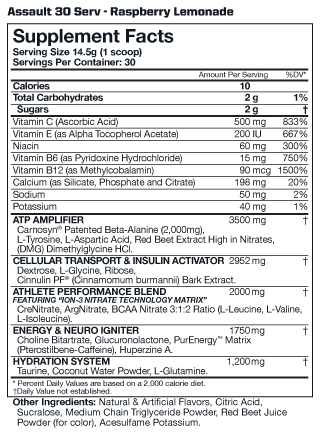 Electrolyte balance is essential for normal cell function. Is one of nature's superfoods. It is a complete balance of electrolytes and minerals - and it maximizes uptake of other nutrients. The sports world has turned to coconut water concentrate as a rehydration source due to its superiority to sports drinks. 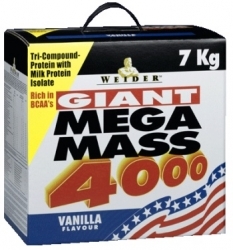 Helps replenish the body's amino acids and glycogen stores. Over the course of a normal day, these diminish. Exercise depletes them further, so glutamine is crucial. Is found in meat and fish, but many people turn to supplementation as well. 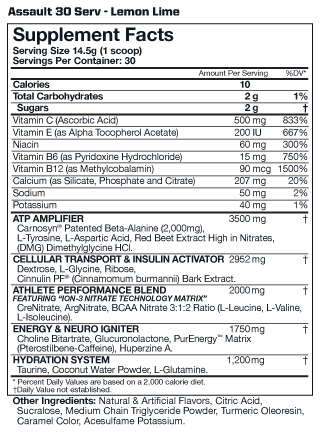 Taurine works with glutamine to move electrolytes like potassium and magnesium between cells. Carnosyn® Patented Beta-Alanine (2,000mg), L‐Tyrosine, L‐Aspartic Acid, Red Beet Extract High in Nitrates, (DMG) Dimethylglycine HCl. Dextrose, L-Glycine, Ribose, Cinnulin PF® (Cinnamomum burmannii) Bark Extract. 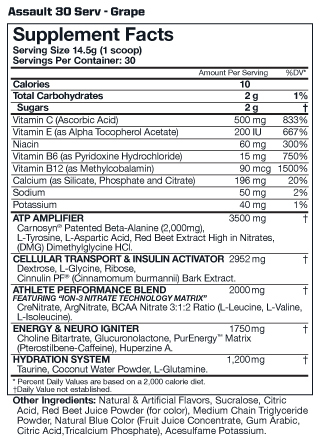 CreNitrate, ArgNitrate, BCAA Nitrate 3:1:2 Ratio (L‐Leucine,, L-Valine, L‐Isoleucine). Choline Bitartrate, Glucuronolactone, PurEnergy™ Matrix (Pterostilbene-Caffeine), Huperzine A. Natural & Artificial Flavors, Sucralose, Red Beet Juice Powder (for color), Citric Acid, Medium Chain Triglyceride Powder, Acesulfame Potassium, Beta Carotene (for color). 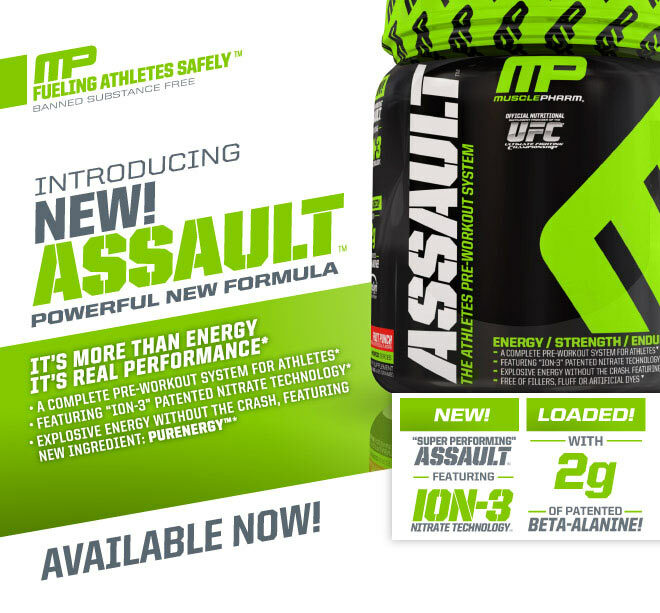 Directions For Assault: Mix 1 scoop of ASSAULT™ in 8-12 oz. (236-354 mL) of water 20-30 minutes before training. For optimal results, drink a minimum of 1 gallon of water daily.